I’m still recovering from foot surgery. After an hour (at most) on my feet I’m achy and need to sit for a while with my feet up. What does this have to do with cooking, you ask? Tom’s been doing the grocery shopping. This is not a hardship for him; he always does the bulk of the grocery shopping. But I’m the one who keeps us supplied with the harder-to-find items (hard to find in a small Midwestern town, at least). That involves driving 45 minutes to an enormous store with a fantastic selection. It takes a good hour to get around the store, more than I can handle at this point. Meanwhile, I’m relying on my pantry. This soup combines the last of our favorite items: chicken andouille, fire-roasted tomatoes, roasted red peppers, and fresh tortellini (from my stash in the freezer). The soup goes together quickly but tastes like it’s simmered for hours. 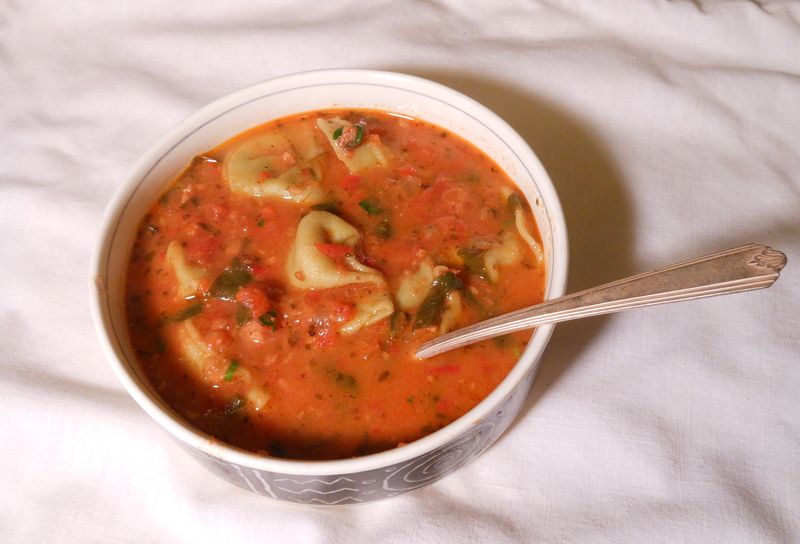 I love the color contrast of spinach tortellini floating in the intensely red broth. Ribbons of spinach accent that contrast. The sweet roasted peppers balance the acidity of the roasted tomatoes, and the tortellini make it a meal. A small handful of fresh basil, chopped and tossed in at the last minute, would be perfect, but parsley also provides that herbal goodness. Use whatever stuffed pasta (tortellini, tortoloni, ravioli) you like. I’ve made this soup without the spinach, stirred a few tablespoons of heavy cream in at the last minute, and added a few shots of hot sauce for vinegary heat. You can certainly leave the sausage out and use vegetable stock for a vegetarian option. In a large stockpot over medium-high heat, brown the sausage in the oil. When the sausage bits have some lovely toasty bits, add the onion, garlic, celery, and chile if using. Cook for about 5 minutes, stirring frequently, until the vegetables are softened. Season lightly with salt and pepper. Stir in the pesto, roasted red peppers, tomatoes, and stock. Once the soup reaches a boil, reduce the heat to medium-low and simmer, covered, for about 30 minutes. Taste and adjust the seasoning. At this point you can purée part of the soup for a thicker texture. Add the tortellini and simmer for another 10 to 15 minutes until the tortellini is tender. Stir in the spinach in the last 5 minutes of cooking. This entry was posted in appetizers, main courses, soups and tagged healthy, pasta, red pepper, roasted red pepper, roasted tomatoes, soup, tomatoes, tortellini, `. Bookmark the permalink. God that looks and sounds wonderful. I keep trying soups on my guys and they just dig in their heels. They’ll eat it (if there’s nothing else around) but claim it’s not a meal. I’m going to try this one. Happy recuperation! My guys love soups, so this is not a hard sell. But what I liked about this one is that it is hearty and filling, while also being secretly healthy. It’s a great way to load them up on veggies while they just think they’re eating pasta. I know what I’m making for supper this weekend! That looks fantastic. I am really enjoying your blog, and I wanted to thank you for checking mine out too. i hope to see you soon and let you know how good this soup was! Thanks, Shannon. I’m enjoying reading your blog too, and learning from it. With any luck (and a little work on my part), your influence will improve my writing. Let me know what you think of the soup. Nancy, that was one of the best soups I have ever had! It was delicious, full of flavor and hearty too. It hit all the taste bud except sweet, unless you count the sweet red pepper. I made a roll to go with it that had pesto and parmesan cheese in the filling, rolled up pinwheel style. Great compliment to a spectacular meal! I’m so glad you are reading my blog. I love writing it, and I think your writing is lovely already. It’s hard to describe flavors well, and I think you do. Keep those great recipes coming. I’m a fan! Shannon, I’m so glad you liked the soup. I realized after I posted that recipe that it’s pretty much the same soup (minus the tortellini) that I served cold this summer (Roasted Red Pepper Soup). But hey, flexibility is my middle name. I’m enjoying your blog as well. I’m going to need that recipe for the rolls. They sound terrific. Where have you been…or rather where did I loose you to?..Anyhow, happy to see this post and will try to keep up…Your soup sounds fab and perfect for this time of year. Don’t you just love fire-roasted tomatoes? Teresa, I’ve been posting about once a week, except for a stretch in Sept. while I was recovering from foot surgery. I’ll do a little troubleshooting with WordPress. And yes, I do love fire-roasted tomatoes. Maybe if I get a better crop next year I’ll try to roast my own. Are you joining the Great Food Blogger Cookie Swap again? I’m testing a recipe (secret!) tonight.